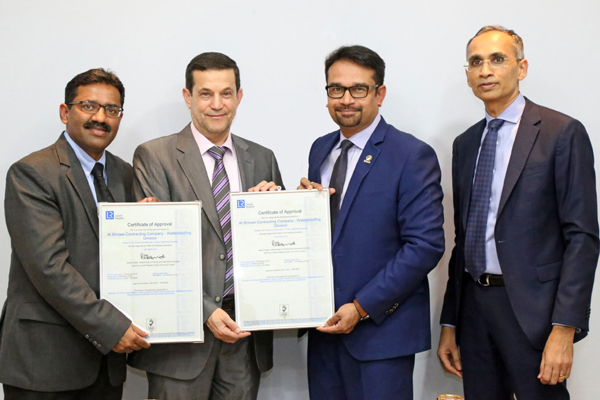 UAE-based Al Shirawi Contracting Company has become the first company in the country’s waterproofing segment to be successfully certified to the ISO 14001:2015 Environmental Management System and ISO 45001 Occupational Health and Safety standards by Lloyd’s Register. A leading waterproofing specialist in the emirates, Al Shirawi said the dual distinction goes to show that the company is focused on enhancing its environmental performance as well as creating better, safer working conditions for its people. The compliance also means that its waterproofing solutions can meet the needs of sustainable buildings, it stated. Pramodh Idicheria, the chief operating officer, said: "The ISO certification acknowledges the maturity of our systems and processes, which were built over four decades. As a group, we regard certification as essential milestones to surpass in our continuous journey towards perfection and excellence." Al Shirawi Contracting Company already has one of the best safety standards in the country, with no major fatality reported in the last 10 years. It recorded 1,547,260 million safe man hours in 2018 alone. Sharad Bangera, the executive director, said: "This certification, in particular, is very special as it is the first one for EMS. It’s a validation that we take our environmental responsibilities seriously, and can manage our contribution to sustainability in a systematic manner." Krishna Kumar, the general manager (QHSE and Business Excellence) said: "Our group has always regarded certifications and the steps leading up to it as a way of scrutinising our existing processes so that we can better ourselves and ensure client satisfaction. As a result, most of our companies already have the latest ISO certification." Al Shirawi Contracting Company, he stated, is one of the most reputed waterproofing companies in the country with several recent contracts wins.